Business apartment for rent in St Petersburg: Moyka emb., 18. 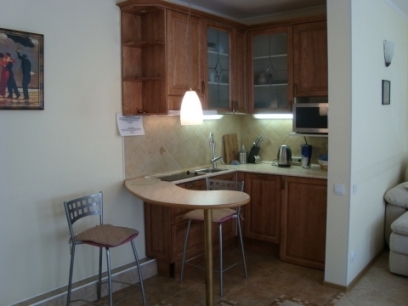 This cosy studio apartment is situated in 2 minutes of walking from the Hermitage. This cosy studio apartment is situated on the 1st floor of the building at the 18, Moyka emb., in 2 minutes of walking from the Hermitage. Windows views to the quite green yard. It is prestigious area in the heart of historical city. The apartment is fresh renovated. In the apartment you will find comfortable furniture, modern kitchen with built-in home appliances. There are all the utensils, bed-linen and towels. The bathroom equipped high-quality ammenities and jacuzzi. The kitchen is combined with a dining room in which also there is a folding sofa (it is possible to use as an additioal berth). Safe acceed from the street. There is an intercom on the front door. Windows views to the quite green yard. It is prestigious area in the heart of historical city.